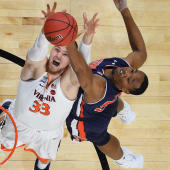 The deadline for underclassmen to submit paperwork declaring their intentions to enter the 2019 NBA Draft passed on Sunday night, and final news is finally trickling out Monday about the late entries. Among the dozens who have already joined the draft process are Duke big men Marques Bolden and Javin DeLaurier, who both entered the draft in the final hour. Kentucky big man Nick Richards has also submitted paperwork to enter the draft; all three have the option to return to school under new NCAA rules set in place this year. The blueblooded trio makes up for what has been a flood of underclassmen entering the draft. At Duke and Kentucky alone, a combined eight players are at minimal testing the waters. Six begin the process as projected first-round picks, foreshadowing what will likely be another major roster overhaul for the college basketball powerhouses. Only 60 players can get drafted, but there is close to 100 underclassmen who have initiated the draft process and will go through workouts to get feedback by scouts and teams about where they might land in the draft and how they can improve their game.